Anytime Anywhere Access allows you to remotely browse, search, and restore backed up files from your account. You can log into your Carbonite Safe account from any computer to get started. Multiple files larger than 10GB can be restored using the Carbonite Backup Drive (Windows) or the Carbonite software (Mac). Sign into your account with the button below to view a list of your computers that are backed up with Carbonite. Click View Files on one of the computers to open Anytime Anywhere Access and browse your backed up files. It may take 24 hours for new or changed files to appear using Anytime Anywhere Access. Most recent backups can be viewed through the Carbonite Backup Drive (Windows) or the Carbonite software (Mac). The backed up files and folders will be organized the same way that they exist on your computer. To restore a copy of the files, follow the instructions below. Navigate to the file location(s) within Anywhere Anytime Access. In this example, we navigated to the user’s Documents folder. You can also use the search bar to type in a file name or file extension. Select the checkbox(es) next to the files and folders you wish to download. Click Download to begin downloading your files to the computer. Please ensure that your browser remains open during the download process to avoid interruption. If your internet connection is interrupted while restoring with Anytime Anywhere Access, the download will fail, and you will need to restart it. 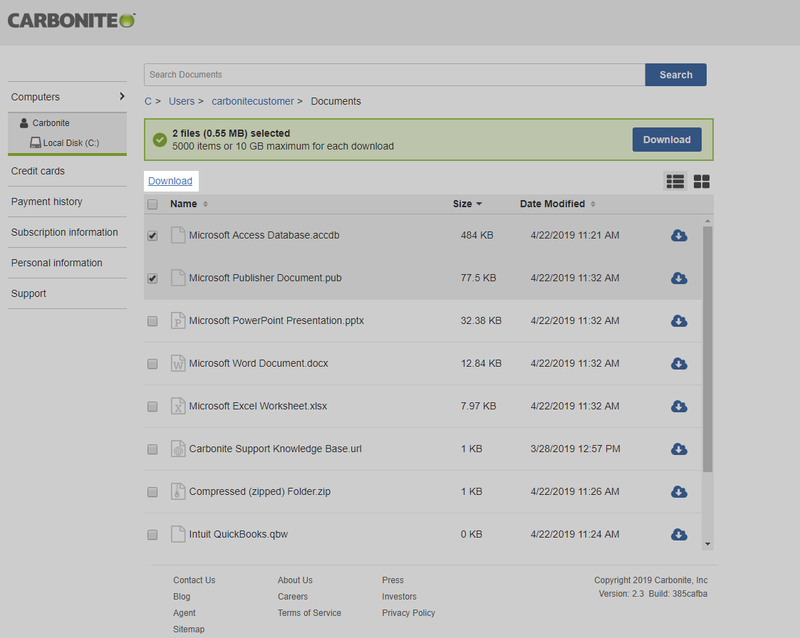 Logging out of your Carbonite account after initiating a download will not stop files from being restored. The downloaded files will appear as .ZIP file in the Downloads folder or to the location that you specify on your computer. If you are having trouble downloading a single file and it does meet the Restore Selections and Size Limits, please try adding a second small file to the download. Downloading multiple files from Anytime Anywhere Access at a time will compress the files into a single ZIP file to make the download faster. 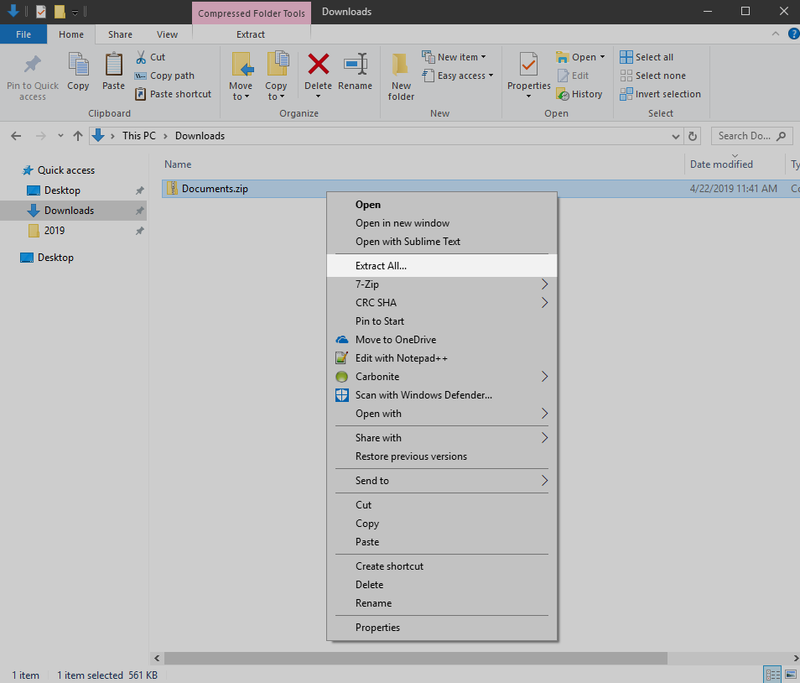 Navigate to the ZIP file in Windows Explorer. The restored file(s) by default should be in your Downloads folder. Right-click the ZIP file and select Extract All. 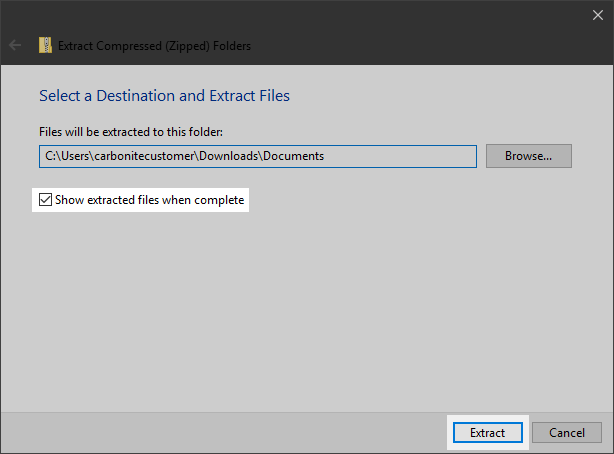 Check Show extracted files when complete and click Extract. You can click Browse… if you want to manually extract the files to a different location on your computer. After the extraction completes, the restored folders will appear as they appeared in Anytime Anywhere Access. 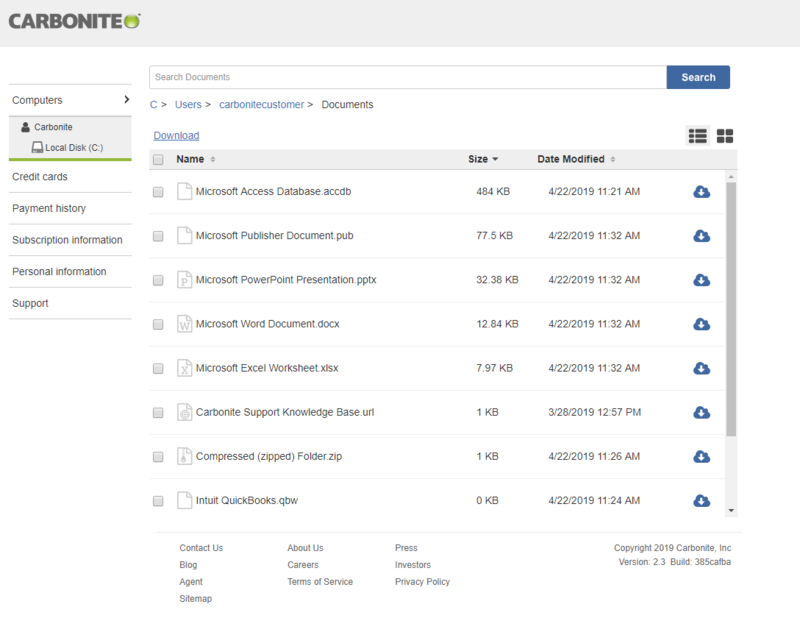 Carbonite's Anytime Anywhere Access feature is best for remotely accessing small amounts of files and folders. It is not intended for complete restores. Depending on the type of download, there are different limitations per session. 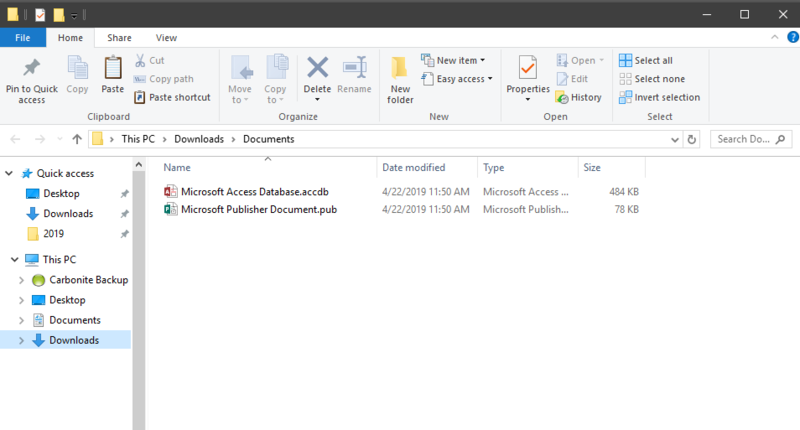 As you explore your backed up files on Anytime Anywhere Access, you may notice deleted file alerts on some of your files. These notices appear based on the Carbonite Safe retention policy. 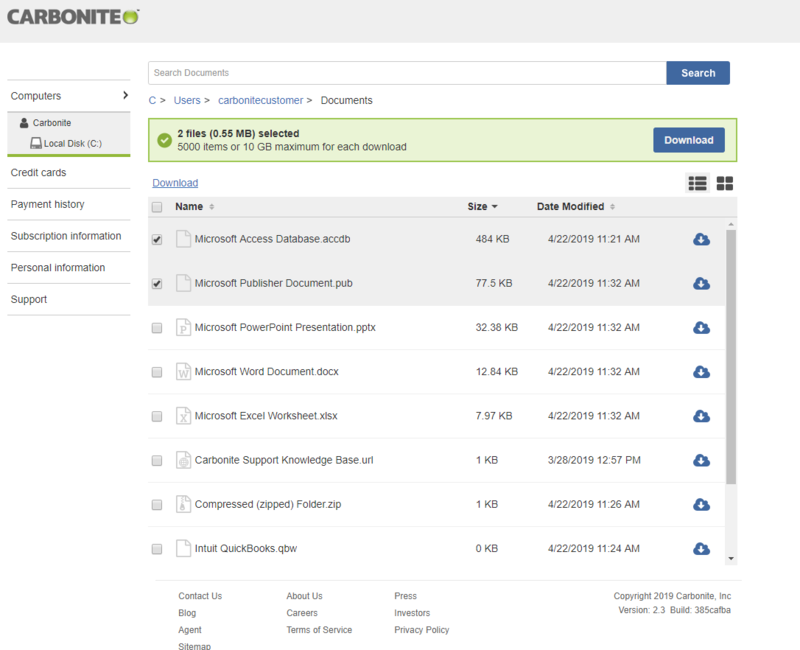 Put simply, this means that if you delete files from your computer, Carbonite will remove those deleted files from the backup after 30 days.